There are many known hives causes. Hives are swollen patches of skin of various sizes. They can be the size of small pimples or large patches of skin, the size of a quarter or larger. The hives are often red and are usually itchy. They may sting and/or or result in a burning sensation of the skin. Hives are generally very uncomfortable and very stressful because they are rather disfiguring when they appear on otherwise healthy looking skin. Fortunately, for most people hives occur in acute episodes and after a short time such as a few minutes they disappear until the next hives “break-out”. For a smaller portion of people, the hives may be present for several days or longer or appear every day. This is more of a chronic hives problem. So, what are the common causes of hives? There are several very common hives causes. The first is an allergic reaction to food or drink. Whenever an individual ingests certain foods or drinks, hives may develop if the person is sensitive or allergic to the food or drink. The allergic reaction may only lead to skin hives and no other medical problems or the hives may be an indication that a more serious allergic reaction leading to breathing problems may surface. Always look for other signs of a serious allergic reaction when hives appear. These symptoms include tingling and swelling of the lips and tongue, tightening of the throat and chest, coughing, and difficulty breathing. If any of these occur with or without the appearance of hives, then medical attention should be pursued immediately and without delay. Note that sometimes hives and more serious allergic symptoms do not occur immediately after ingesting the offending food or drink. Other hives causes that result in similar symptoms as described above include adverse reactions to medications or drugs or insect bites. What are some of the lesser known causes of hives? There are several hives causes that most individuals are not familiar with. First, hives can be caused by pressure on the skin. The pressure can include rubbing of the skin, scratching of the skin, or even bumping or any kind of pressing on the skin. Often, the pressure does not need to be excessive for the hives to appear. In some cases the skin is affected immediately (dermographism) whereas in other cases the hives may only appear after several hours. The skin hives appear locally, at the site where the pressure was applied to the skin. 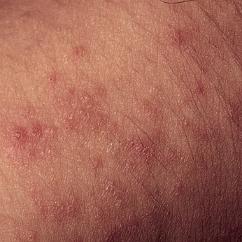 Stress is another possible reason why hives would appear on the skin. The mechanism as to why stress leads to hives is not clear, but when an individual is under constant stress the body does react in unusual ways in order to try and deal with the stress. Temperature is another one of the causes of hives. When the skin is exposed to cold or to heat then skin hives can develop in certain individuals. Sort of related to the heat hives cause is solar hives. For some individuals, when their skin is exposed to the sun they develop hives in those skin areas. A very rare form of hives is aquagenic hives or in other words the development of hives as a result of contact with water. As is evident from the above discussion, because there are so many possible causes for hives, it is difficult in many cases to pinpoint what causes hives in an individual. The lucky hive suffering individuals are able to find the cause and avoid the trigger. However, even if the cause is known, avoidance may still be an issue. For example, how realistic is it to avoid contact with water, the sun, and any type of skin pressure? For many others, the cause or causes cannot be isolated and these individuals resort to controlling their hives symptoms with medications such as antihistamines. Another alternative approach is to strengthen the body naturally against the formation of hives. For some, this is a better course of action than simply trying to subdue the hives symptoms. If possible, it is much better to cure the source of the problem. The hives treatment at the link below has been tested for effectiveness and was developed by a long-time practicing medical doctor and is worth investigating by those individuals suffering with skin hives.